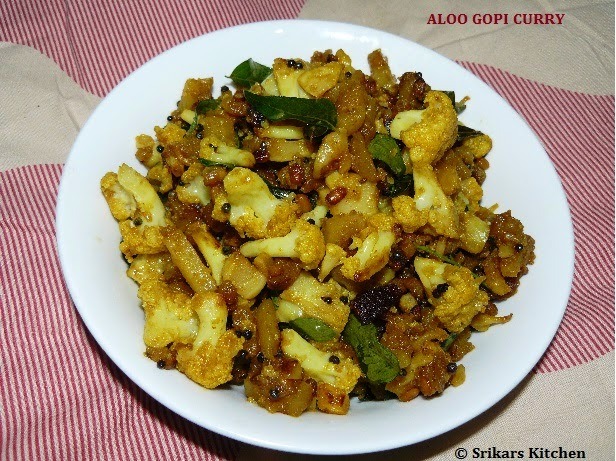 Aloo gopi curry- This is very tasty & easy to make . we love this curry especially my hubby. I learnt this recipe from MIL.i used peeled potatoes, Becoz my daughter doesn't like skin. You may use with with skin as well. Heat oil in a pan, add mustard seed, urad dal, curry leaves & allow to temper. Add peeled & chopped potatoes & mix well. Add sambar powder,salt,hing & mix well. Cover the lid & cook it until the potatoes are almost done. Add cauliflower florets, turn the heat off and leave to rest.